Ruby eating a treat, originally uploaded by espeedy123. 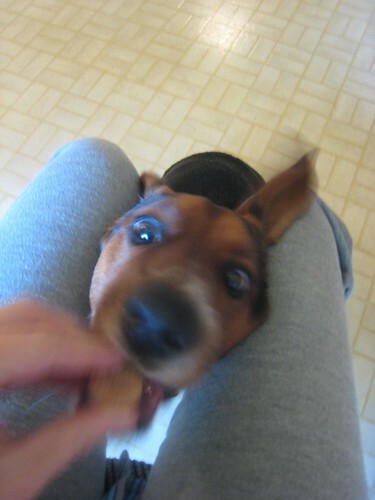 Ruby sure does like treats, and she’s such a good girl I give her a bunch of them. Today I decided to make her some homemade ones. There are tons of recipes for these online, from the mundane wheat treat to the way-out beef liver brownies. In a large bowl, dissolve yeast in warm water. Stir in the parsley, garlic, broth, honey, and egg. Gradually blend in flour, adding enough to form a stiff dough. Transfer to a floured surface and knead until smooth (about 3-5 minutes). Shape the dough into a ball, and roll to 1/4-inch (6 mm) thick. Using small bone-shaped cookie cutters, make biscuits! Transfer to ungreased baking sheets, spacing them about 1/4 inch (6 mm) apart. Gather up the scraps, roll out again, and cut additional biscuits. These were easy to make using the mixer, and if you cook at all it’s likely you have all this stuff. Cutting out each biscuit gets tedious, and since Ruby doesn’t mind, I switched midway to diamond-shaped biscuits cut out using the pizza cutter. I give them four out of five stars for human taste. Ruby gives them about three and says she’d like it if I tried out the liver chewies next time! Ruby, originally uploaded by espeedy123. 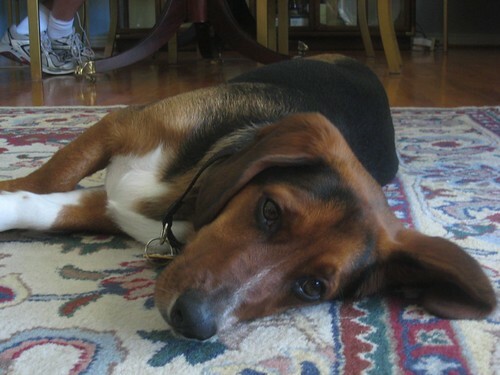 On Tuesday afternoon Michael and I brought Ruby home from the pound. We think she’s half beagle-half hound. She’s 100% sweet dog! This is our first dog together, and it’s been an intense couple days of acquiring her accessories and learning what she does. I plan to make her some dog treats soon! Fancy Chicago Trash Can, originally uploaded by espeedy123. 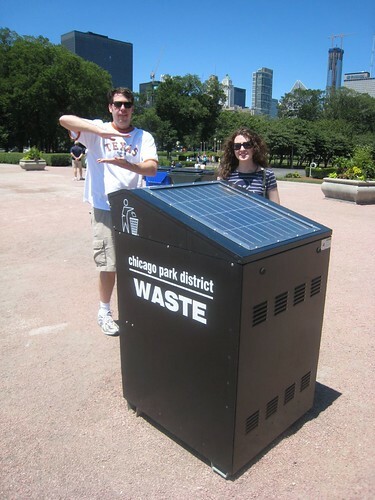 Living up to its cleanest-big-city reputation, Chicago now has super fancy solar-powered trash compactors. We were there visiting this weekend and disposed of some trash in one of these “Big Bellies.” Michael is showing with his hands how he thinks the trash is compacted, but he is not solar powered. Amy is probably wondering why we are so amused. The Big Belly site says the device fits five times as much trash as a regular can, thus reducing the number of trips to empty it by 80%. That saves a lot of energy. It seems like a pretty good idea to me. Anyone seen these in other cities yet?